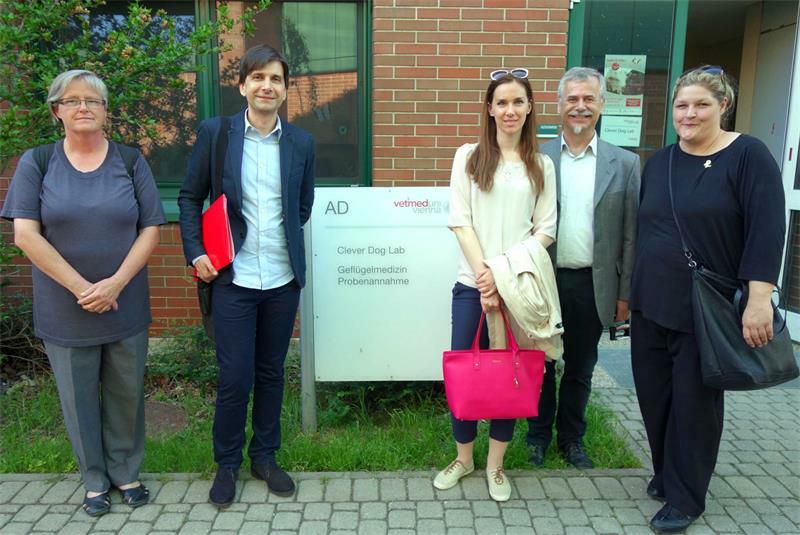 The 2nd meeting of CEN/TC 452, Assistance dogs, the secretariat of which is held by the Croatian Standards Institute (HZN), was held at the University of Veterinary Medicine Vienna on 16 May 2017. The meeting was chaired by CEN/TC 452 Chairman Marijan Alfonso Sesar, Director of Rehabilitation Centre Silver (CZRS). Members of the Croatian delegation were Julijana Gyorgy Matešić (CZRS), Mira Katalenić (Croatian Guide Dog and Mobility Association), Alexandra Purkolt (CZRS) and Lea Devčić (Croatian Guide Dog and Mobility Association). The decision on the final title and scope of CEN/TC 452 in the English language in accordance with the results of Committee internal balloting (CIB) was confirmed at the meeting, its title being Assistance dogs and its scope Standardization in the field of assistance dogs, users and training staff. The decision to establish cooperation of CEN/TC 452 with CEN/CLC/TC 11 „Accessibility in the built environment“ has been adopted. Ms. Christel Sogenbits will represent CEN/TC 452 in CEN/CLC/TC 11. The request of the Standards Council of Canada (CSB) for observer status in CEN/TC 452 has been accepted. CSB became a Companion Standards Body of CEN/CENELEC on 1 April 2017, allowing it, among other things, to take part in the work of European technical committees. It has been agreed to reconsider the interest of umbrella organizations in the field of assistance dog training (ADEu and IGDF) in obtaining the liaison organization status in CEN/TC 452. In accordance with CCMC’s recommendation to develop the CEN/TC 452 Business Plan as soon as possible in order to enable its visibility for external and internal stakeholders, the TC has agreed that the TC secretary Vesna Ferenčak Brodarić will prepare a new version of the draft Business Plan in accordance with the comments received and the agreement made at the Vienna meeting and to request the TC members to adopt it by correspondence (using CIB). The TC has decided to establish Working Group CEN/TC 452/WG 1 “Terminology“. WG will establish terminology and definitions. A public invitation will be sent to apply for chairing the WG as a convenor. If several applications are received, the convenor will be selected by correspondence (using CIB) and the NSBs will be invited to nominate experts for the WG. The new meeting of CEN/TC 452 will be held on 7 and 8 December 2017 in Zagreb. The photographs show the atmosphere at the meeting and the visit to CleverDogLab, society linked to the Vienna University of Veterinary Medicine that studies the cognitive and emotional abilities of dogs.